We all have those walls that are calling for attention. Some are in a central location and others creep down a long hallway. Either way, that wall calls for something grand or meaningful. It wants to have more than a couple pictures to fill it up, it wants to tell a story. While artwork itself could tell the story, I was wanting to personalize the focal wall in my dining room. Since my house has an open floor plan you can see this wall from most places in my home, so it had to planned out. First, I started with the photographs. I used Photographer and Graphic Designer, Marcie Kindred to take our family pictures. Once I selected the ones to go on our wall and the sizes to order, I made a sketch of the wall and planned where each would go. Next I had to find the frames. I kept a list of the sizes I needed so when I found the deal I was looking for I could snag it up. Most of the frames came from yard sales and thrift stores. Once I decided on the colors, I primed and painted the frames. Finally, I printed out the wedding prayer that my dad wrote and said over us in our wedding and added it to a shadow box frame. I pinned some trailing hearts inside. If you want to read the whole prayer, you just open the door. It has the color and meaning I was going for. 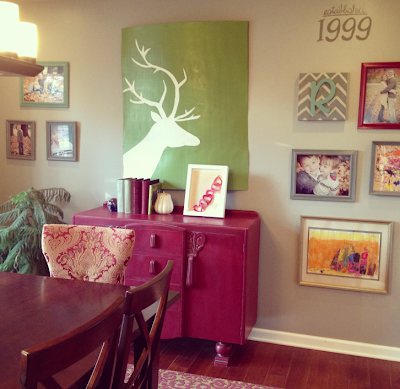 The deer I painted the year before and now my wall is finished! 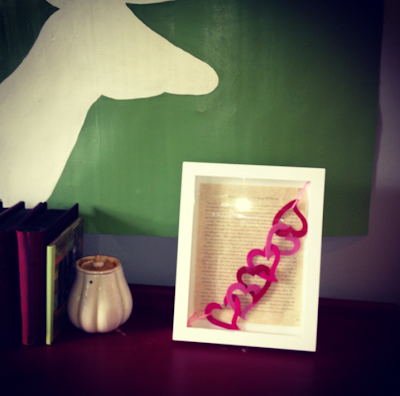 Hope this inspired you to let your gallery wall show your family and personality and most importantly, tell the story. Remember ~ fantastic photographers MAKE your gallery wall! Check out mine below.